Bran-Encrusted Levain Bread. Photo by Alan Weiner for "Flour Water Salt Yeast"
While bread has been a staple of the human diet for thousands of years, perfecting that delicious crunchy exterior and soft, airy middle can seem daunting to even experienced cooks. 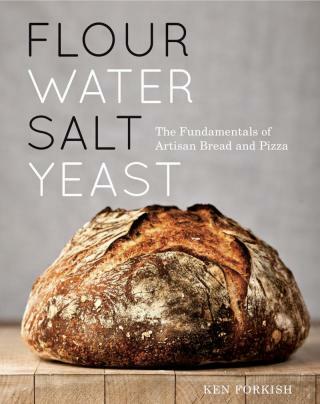 Yet, Ken Forkish, author of "Flour Water Salt Yeast," says with just a little preparation and time, baking bread at home is simple. "Doing something you haven’t done before, until you try it, there's always like a doorway that you need to walk through," he said. Bread recipes are generally uncomplicated and require very few ingredients, Forkish said, but the number one mistake new bread bakers make is not practicing enough patience. Many recipes promise bread in just a couple of hours, and while this can be done by adding a higher amount of yeast and including sugar to accelerate the fermentation process, it doesn’t make for a very interesting loaf of bread, he said. "One of the critical ingredients is time," Forkish said. "If you can have a recipe that uses an amount of time to really develop the flavor and the texture and the character of the bread, then you're going to get much better results." Forkish’s recipes typically call for at least six hours of rising time — which on the surface may seem like too much to devote to bread, but with a little planning can be worked into your schedule. "You can manipulate time and other ingredients so that you can have some variety in your schedule, so you can do this and make it work within your day to day life," Forkish said. While those long rising times do mean thinking ahead, much of it is just leaving the bread alone. Take Bran-Encrusted Levain Bread, which Forkish recommends starting about 24 hours before you want to eat it, the active work requires only mixing and shaping the dough. And for Pizza Margherita using Overnight Straight Pizza Dough, Forkish says to make the dough the night before you plan to have it for dinner. "Think of time as the most important ingredient," he said. "You can't make a good pizza dough or a good bread dough in two hours. The nice news is that for either one of these things it's not very much active time, it’s elapsed time where you can be doing other things." After time, temperature is another important ingredient for good bread. Depending on the recipe, the temperature of the water should be about 90 degrees, which you can measure using a cheap thermometer. It helps to think about bread baking as a fermentation process, Forkish said. "Essentially if you mix a dough that you need to rise for six hours or more, it will only get to that spot if the dough is at the right temperature," he said. "If you mix it too cold, the dough is going to move a lot slower. If you mix it too hot, it’s going to move too fast." For a final quick tip to make a good, consistent loaf, Forkish recommends measuring all of your ingredients by weight, not volume. "My cup of flour is way different than your cup of flour," he said. "It's not hard at all, so if you can get used to using a kitchen scale, you’ll get better results. Period."